We would like to thank Mistress Aildreda de Tamworthe for all of her hard work curating A&S research papers since the Gazette began publishing them in 2015. Mistress Elysabeth Underhill will be taking over this role for Aildreda. An updated Call for Papers is below. Have you just finished some fascinating original research? Can you tell us about a day in the life of your persona? Do you have a fabulous method of producing something in a medieval style? The East Kingdom is rich in artisans and scientists, and the East Kingdom Gazette provides a platform for their written work to be shared by publishing Arts & Sciences Research Papers. To see topics covered by past papers, you can search for the “research paper” tag on the Gazette website. If you are interested in submitting a paper, but have questions or are unsure of the suitability of a topic, please ask our Article Curator, Mistress Elysabeth Underhill (137268@members.eastkingdom.org). Lissa is happy to work with authors to help them shape their paper. – The Gazette reserves the right to fact-check all articles, and also to edit for grammar and clarity. All resulting revisions will be given to the original author for review. – There is no limit to the number of submissions, but each author will be limited to one posted article per calendar year. – Articles should focus on arts and sciences topics that exist within the SCA period. Examples include: how to recreate a period X or Y; history lessons; a day in my persona’s life; experimenting with period techniques; and original research. – Submitted articles are typically between 5-10 pages. – Please submit all papers as a PDF, MS Word document, or through Google Docs. – Links to existing personal websites are welcome within an article, but should not replace the article. – The Society champions courtesy, and properly crediting the work of others is both courteous and required. Images that are not your original photos must be fully cited. Quotations or ideas drawn from other sources must be likewise fully cited. For examples, please see: http://www.wikihow.com/Cite-Sources. 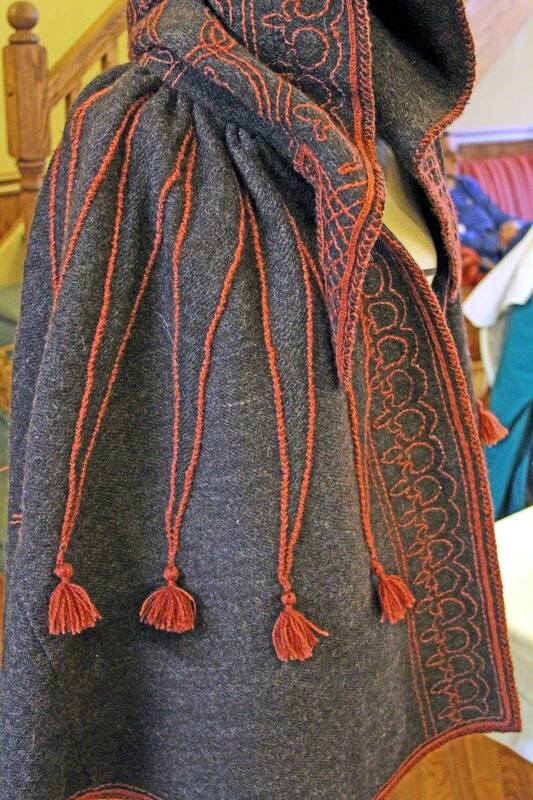 A riding cloak made in the Spanish style by the author. Photo courtesy of Stephanie Miklacic. My name is Lady Olivia Baker. I am your new Kingdom Minister of the Lists as of yesterday morning! First and foremost, thank you to Mylisant, and her entire team in the KMoL office for the past 2 years! Their time, work, and dedication have been an asset to the Kingdom. Thank you all! I wish them all a much deserved break! If you have previously sent in or given me your paperwork and are waiting on cards, please be patient with me as I work to put together my team and work through the paperwork I currently have. If you have any questions or concerns regarding your cards or the information on your cards, you can reach me at mol@eastkingdom.org. Though, again, I ask for your patience in responding. I will hold office hours Monday from 4 PM – 7 PM. Thank you all for your patience. I’m honored to have been chosen and am looking forward to my time serving this great Kingdom! The first challenge is that each performance must compliment the person performing directly after them. The second challenge is told best in Her Majesty’s own words. The performers have 15 minutes to prepare.